Our favorite high school style is back for college. Remember the days of high school football games and homecoming dances? Not too long ago, those occasions were the highlights of our seasons. Whether high school is something you miss or perhaps something you would rather keep in the past, that Friday night lights spirit lives on. 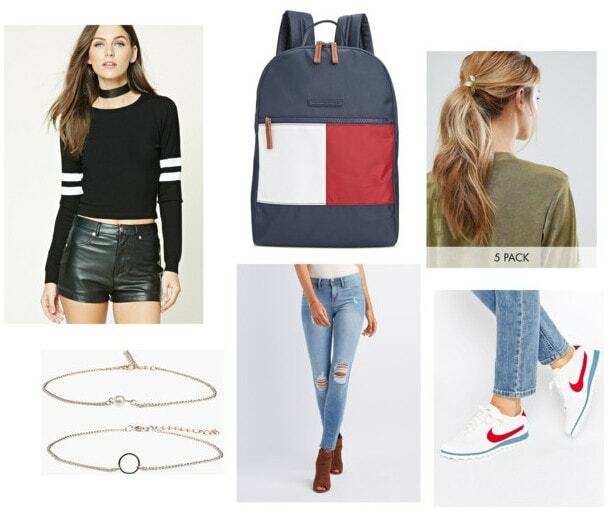 There’s no denying the preppy nature of a varsity sweater, however, with a few accessories and some styling tricks, you can make one work with any aesthetic. Read on to see how the varsity sweater can be styled for class and a night out. This simple black and white varsity striped sweater is incredibly versatile and is an ideal academic-inspired piece for finals week. The word “varsity” reminds me of an all-American vibe, so I combined red, white, and blue with a fresh pair of Nike sneakers and a festive backpack. Add a low-maintenance pair of jeggings and simple accessories, and you are out the door. An all-black outfit always looks chic and put-together. Here, a leather skirt brings a sense of edge to the varsity vibes while the bold velvet choker and burgundy booties are perfect for the holiday season. To keep yourself warm while out and about, rock comfortable tights to fight off the cold. The velvet accessories continue with an embellished handbag that is sure to be a conversation piece. Is the varsity look too preppy or just the right amount of academic? Let me know which look is your favorite!